The Carr Fire burns a building along Highway 299 near Redding on Thursday. Wildfires are once again claiming homes and lives in a Northern California city that has pushed into wildfire-prone areas. The Carr fire near Redding fits a deadly pattern, sharing traits of the firestorm that destroyed thousands of homes and killed dozens last year in Sonoma and Napa counties. Since 1947, more than two dozen fires have burned in the same area as the Carr fire. 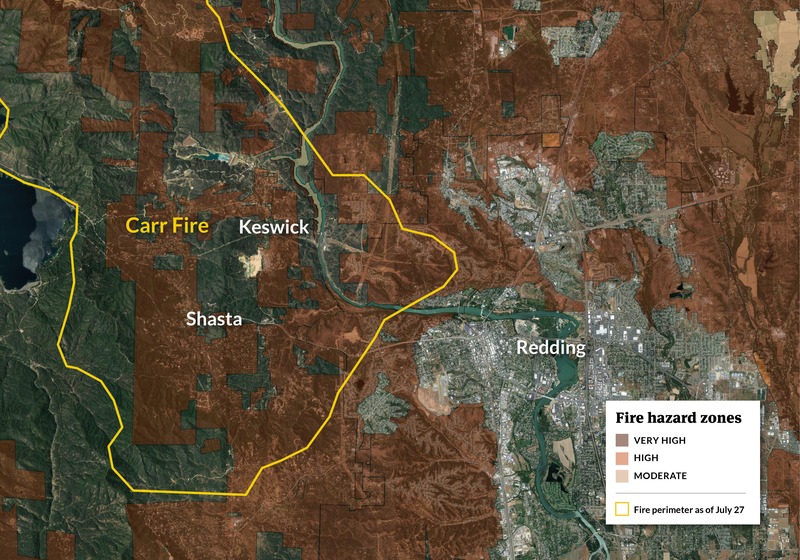 Most of the area surrounding Redding has been rated as a very high fire hazard, according to the California Department of Forestry and Fire Protection. Redding, like the Santa Rosa area, has also grown over the past few decades. The city has pushed into the Northern California wilderness, placing homes among oak trees and flammable chaparral outside of town. Many of those homes now wait in the fire’s path. Already, dozens of buildings have been destroyed in the fire, which started on July 23 near Whiskeytown Lake, northwest of Redding. On Thursday night and Friday morning, the fire pushed into the city of Redding, which has a population of nearly 92,000. The death toll so far includes at least two emergency responders, according to the Sacramento Bee. A private bulldozer operator died Thursday while working in an area where the fire was active. A Redding firefighter was also killed, authorities announced Friday morning. Three more firefighters were hospitalized for burns to their ears, face and hands they received while protecting buildings from the 44,000-acre fire. Fire officials estimated Friday morning that 65 buildings had been destroyed and another 55 damaged, even as winds picked up this afternoon. A heat wave has brought triple-digit temperatures to the region, making fire activity even more severe. Like Redding, the areas burned last year in Sonoma and Napa counties were no strangers to wildfires. Among the communities hardest hit in October was Fountaingrove, an upscale neighborhood perched on the hillsides and ridgetops above Santa Rosa. Those same hills burned in a 1964 fire with a nearly identical footprint. State officials had rated large portions of the area as a high-fire-hazard zone. Reveal found in an investigation that city officials backed off proposed fire-safety restrictions that would have prevented dense housing on such fire-prone land. California is not the only state where homes are being built in fire-prone areas. Reveal found that nationwide more than a third of the homes constructed since 2000 were built in places at risk of wildfire. 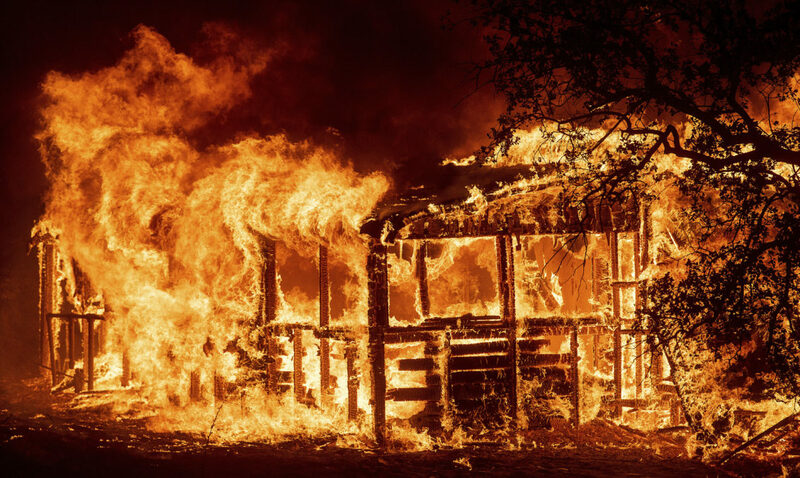 The investigation also found that 70 percent of all fires occur outside of the western states typically associated with wildfires. Gatlinburg, Tennessee, saw a fast-moving wildfire in 2016 that killed 15 and destroyed more than 2,500 homes. Other countries are losing homes and lives to wildfires too. Earlier this month 85 people were killed and hundreds of homes were destroyed in Greece. Last year, Portugal wildfires claimed nearly 70 lives, the largest death toll from wildfires in the country’s history. Reporter Patrick Michels contributed to this story. Eric Sagara can be reached at esagara@revealnews.org. Follow him on Twitter: @esagara.